Kind to skin, no harsh chemicals or de-inking agents (Chlorine bleach, B.P.A etc). Ultra-sustainable, bamboo grows up to a metre a day, regular tissues are causing mass deforestation as they use tree pulp. 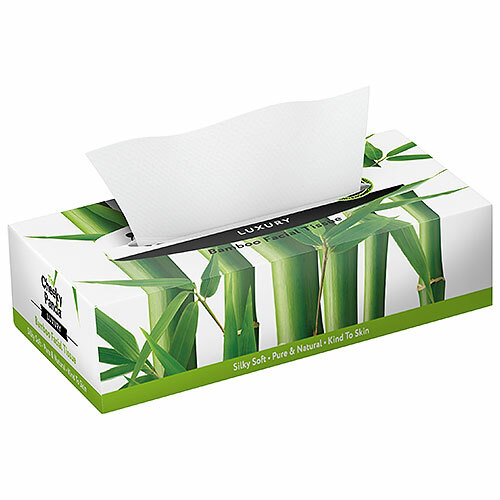 Made from 100% natural virgin pulp bamboo, FSC certified and the first tissue in the UK to be Vegan registered! Bamboo is the fastest growing plant in the world! Bamboo grows at incredible rates - making it one of the world`s most renewable plants. It grows 30 times faster than the humble tree and also produces 30% more oxygen, whilst absorbing 35% more carbon. This is one plant with plenty of environmentally friendly credentials. Bamboo is anti-bacterial, anti-fungal, odour resistant and hypo-allergenic - all of which means that skin, even the most sensitive kind, simply loves bamboo; and no nasty chemicals such as harsh de-inking agents or B.P.A are added. The Cheeky Panda actively seek out new ways of protecting the environment and not just through their eco friendly and sustainable products. They have recently partnered up with the World Land Trust on a carbon balancing project, enabling them to positively impact our living environment one step at a time. Below are reviews of The Cheeky Panda 100% Bamboo Facial Tissue Flat Box - 80 Tissues by bodykind customers. If you have tried this product we'd love to hear what you think so please leave a review. Great to find tissues that are not made from trees, and I'm pleased that the boxes don't have those plastic inserts in them like most other tissues have. They aren't that soft though, and you don't get as many tissues in a box as other brands. Kind to skin, no harsh chemicals or de-inking agents (Chlorine bleach, B.P.A etc). Ultra-sustainable, bamboo grows up to a metre a day, regular tissues are causing mass deforestation as they use tree pulp.